Having graduated from from college and on track to live The American Dream, Benjamin Braddock is not so sure that that is what he really wants or even what that really means. It’s 1967, societal paradigms are being deconstructed and Ben’s self-assuredness, intelligence, angst and inexperience combine to mire him in months of indecision and a retreat into his parents’ home and the arms of Mrs. Robinson. Why, exactly Ben chooses to sleep with the much older, alcoholic, intellectually stunted woman is not clear; but she serves as a foil to Ben’s potential. Having lived according to the dictates of mid-century life, she has ended up as damaged goods and has the capacity to keep Ben bogged down. And why Mrs. Robinson chooses to seduce Ben remains equally unclear. She does not seem to gain anything other than immediate gratification from their relationship, though amelioration from the disappointments of her own life are implied. The situation becomes further complicated when Ben is set up on a date with Elaine, Mrs. Robinson’s daughter! The Graduate is a comedy that finds its humor in finding the absurdity of the quotidian. Underneath the ideals of American life is the messy, complicated and bizarre constructs of human emotions and reactions. If you didn’t laugh, you might cry; but there are great lines and ripostes written into the script and, the performances of the full cast ensemble show remarkable timing and chemistry. Kathleen Turner and Matthew Rhys reprised their roles as Mrs. Robinson and Ben respectively from the original run ten years ago in the West End. The L.A. Theater Works production is a live stage reading and the audience’s reaction to the exchanges provide the auditory cues for the listener. There are no foley effects, so the audience serves as the relay between the immediate action of the performers and the listener. The audience is always one step ahead, laughing, responding perhaps to the body language or facial expressions of the actors, while the listener waits for the explanatory line. While somewhat disconcerting, the overall performance comes across as fun and funny. You’ll wish you had been there! After graduating, Ben was at a crossroads in his life: He could either follow the path that his past had circumscribed for him or; he could try and forge ahead, creating his own path. We encounter similar choices almost continually in our lives: to go to college or not; to take on pre-med or theater courses; to live in a garrett starving for our art or selling out to take a computer programming job that pays… For decades, people were lifers in corporate jobs, pursued a single career or vocation. Now re-inventing one’s self and having multiple careers in a single lifetime are very common. Do you think that the social revolutions of the 1960s played a role in forming the now-quotidian search for self (as manifested by what we do?) Extra points if you manage to incorporate “post-modernism” in your comment(s)! 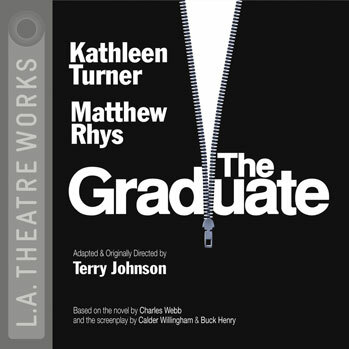 I purchased a digital dnload copy of The Graduate (based in the novel by Charles Webb and the screenplay by Calder Willingham and Buck Henry; dramatized by Terry Johnson; performed by a full cast starring Kathleen Turner and Matthew Rhys) from iTunes. I receive no monies, goods or services in exchange for reviewing the product and/or mentioning any of the persons or companies that are or may be implied in this post. Armin Shimerman (who is perhaps best known for his television work as Quark on Star Trek: Deep Space Nine and Principal Snyder on Buffy the Vampire Slayer) opens the narrative from a bartender’s point of view. With a story like Zorro, an iconic adventure tale that has not been innocent of advancing certain Mexican stereotypes, there is the danger of rendering the story from a cartoonish and politically incorrect voice; but Armin Shimmerman tiptoes to the edge of this caricature without giving offense and sets the tone for a fun tale of adventure and romance. Val Kilmer (memorable for his roles as Batman in the movie, Batman Returns and Doc Holliday in the movie, Tombstone) performs the roles of two characters: the fopish Don Diego and, of course the daring Zorro himself. Val Kilmer never pulls any punches: Always delivering his lines with the verve, slyness, humor or meekness as his roles demand. His performance (and his innate sexiness and talent) make it easy to see him, in the mind’s eye, as Zorro! *Being unfamiliar with Californian history and, as the story does not provide a specific time frame, I referenced The Legacy of the Fox: A Chronology of Zorro by Matthew Baugh with updates by Win Eckert, a fan-created web-site. I received a MP3-CD copy of The Mark of Zorro (based in the novel by Johnston McCulley; dramatized by Yuri Rasovsky; performed by a full cast starring Val Kilmer and featuring Ruth Livier, Elizabeth Peña, Armin Shimerman and Meshach Taylor) from Blackstone Audio, Inc. under reviewer auspices. The copy I received has a corrected cover from the web image above (Johnston McCulley’s last name is misspelled on the cover art image featured on web-sites.) 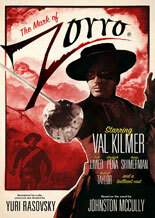 I had no involvement in the production of The Mark of Zorro (based in the novel by Johnston McCulley; dramatized by Yuri Rasovsky; performed by a full cast starring Val Kilmer and featuring Ruth Livier, Elizabeth Peña, Armin Shimerman and Meshach Taylor.) I receive no monies, goods or services in exchange for reviewing the product and/or mentioning any of the persons or companies that are or may be implied in this post. 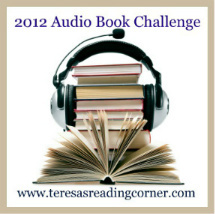 Rumo & His Miraculous Adventures (by Walter Moers; narrated by Bronson Pinchot; Blackstone Audio, Inc.) – Bronson! 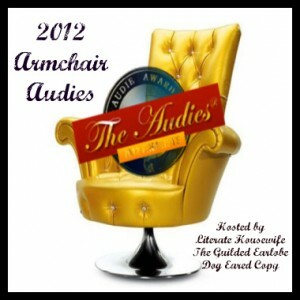 My Korean Deli (by Ben Ryder Howe; narrated by Bronson Pinchot; Blackstone Audio, Inc.) – Bronson again! 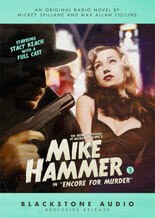 The New Adventures of Mickey Spillane’s Mike Hammer, Vol. 3 (by Max Allan Collins and Mickey Spillane; performed by a full cast starring Stacey Keach; Blackstone Audio, Inc.) – Hmmm, I didn’t really like the first volume; but the second volume got an Earphones Award and now this. Maybe I need to re-visit. 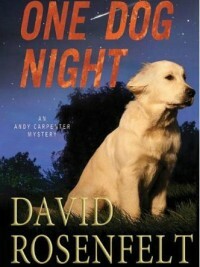 Out of My Head (by Didier van Cauwelaert; narrated by Bronson Pinchot; Blackstone Audio, Inc.) – More Bronson!